There are five people in my life with whom I've had what I call creative relationships. I don’t mean to suggest that they were all significant others—in fact, only one of them was a romantic partnership. When I think of them, I see a tremendous beauty of mind. If they have any unifying traits, this is it. I've been thinking of them for some time as the Pleiades—who, in Greek mythology, were the daughters of Atlas and the sea nymph Pleione. They inherited the animistic traits of their nature deity mother, and the weight of the universe from their titan father. I believe I see each of them for who they are, rather than who I wanted them or needed them to be (which is really the best and purest kind of intimacy). At the same time, these are deeply subjective relationships because these people hold such important places in my life. I know how burdensome this can be. I don't know that any of them even wanted such a role, but love is like that sometimes. I will probably never stop missing them. All I can do is hope that I contributed something good to their lives, as well. 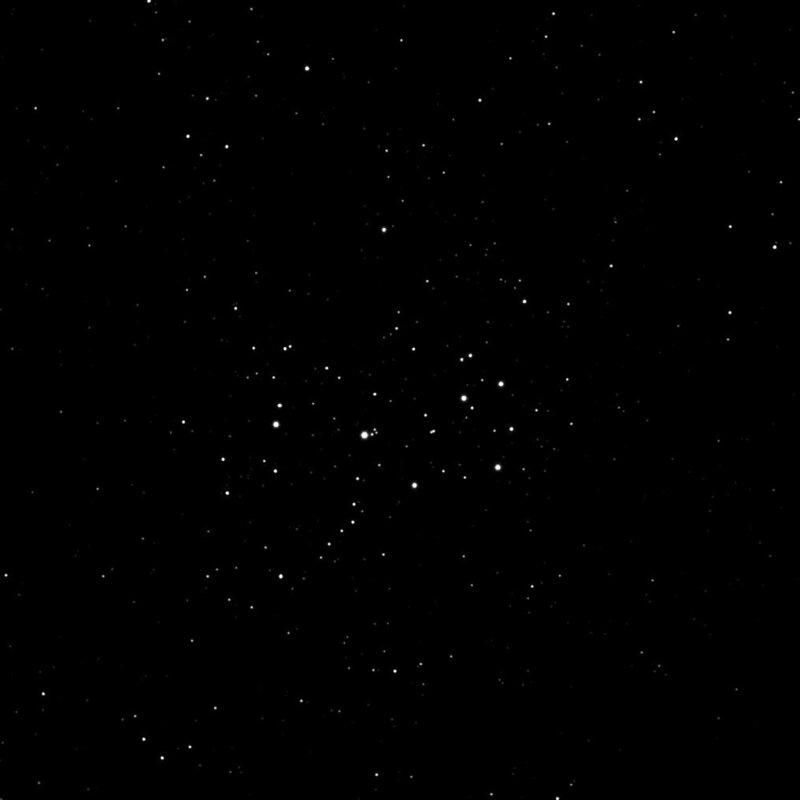 The Pleiades (or Seven Sisters) star cluster. One of the beautiful things about love is that one cares more about the other person's happiness and well-being than about having them in one’s life. I am glad the Pleiad who died is free from a painful disease. I am glad my far-away friends have found a better life for themselves than they would have had here, and I accept the two relationships that have ended—indeed, I am grateful to have had these people in my life at all, even if I never see them again. I am not exaggerating when I say that these people fundamentally changed who I am as an artist. I have a lot of sadness about the fact that I am no longer in close contact with any of them. As I move closer to being a mom, I find myself thinking about the people I want my daughter to know. She will find her own people, though, and she will likely to find herself and her work in different parts of the world than I do. Nevertheless, it’s sad that my Pleiades will exist to her primarily as stories. This month I made a new painting in my insect/flower series: Gadfly x Lotus. Whereas, in the previous paintings, I experimented with convergent forms and species, I am now experimenting with symbols and concepts. It was a gadfly that the goddess Hera sent to sting the maiden Io, transformed into a white calf by one of the many love-interests of Zeus. She was condemned to wander the world as a cow, seeking relief from the bite of Hera’s gadfly. The hero Odysseus's men fell prey to the land of the lotus-eaters. As soon as they ate from the flowers, they stopped caring about their former lives, thereby entering a kind of dreamlike oblivion. I think I'm not the only person who finds oblivion more frightening than suffering. One of my Pleiad friends, Wolf, was once in the hospital. I had never seen anyone in so much pain before. Finally, the nurses administered so much medication that it was a constant struggle to even stay conscious. Wolf became very frightened, and elected to lower the dosage, even if it meant dealing with a level of pain that was close to intolerable. I think I’d have felt the same way. Many of us would rather look a monster in the face than endure its presence in the darkness. Gadfly x Lotus (Tabanus bovinus x Nelumbo nucifera), 2019. Ink and watercolor on paper. Another Pleiad I called Rabbit. Wolf and Rabbit probably did the most to inform my identity: both of them thrust me much farther down the road towards my ideals than I ever would have gotten without them. I'm not just talking about the perfectionistic drive to reach certain standards of personal achievement, I'm also talking about moral issues—which is always a part of my art: my social responsibilities, how I ought to treat other people, my duty to stretch my sphere of influence. I admire both of these people tremendously. Rabbit in particular seemed to symbolize what I myself might accomplish if I worked hard enough. She certainly deserved the high opinion I always had of her, but I see now that it probably wasn't a fair friendship. I was always struggling to keep up, and this likely had negative effects on my own progress, and may have damaged our friendship. Nobody benefits from pedestals—all they do is force people apart. I made art with only two Pleiad friends. One is a truly brilliant poet named Raphael Matto (you can buy his books here), who informed a lot of my early drawings and writing. His work still helps me whenever I need to look at my art from a literary perspective. I still keep particular thoughts and feelings in some of his poems, perfectly intact and waiting for me whenever I need them. The other Pleiad I used to call my steam-engine, and I am still learning things from our now long-past conversations, experiences, and drawings. Before I met her, I didn't understand how to make non-representational art, or even how to think in a non-representational way. I think mainly in pictures, and I think she thought mainly in numbers. I had always viewed numbers-based thinking as unreachable for me, but with her I saw that seemingly disparate cognitive approaches could be analogous. The categorical language of images and the quantitative language of numbers and algorithms had common ground, and there was a network of interlocking, subterranean tunnels between them. These connections, in the context of a person I admired so much—and at the same time, felt such close kinship with—have expanded the way I think. Many people feel lost when they look at abstract art, but it's really very simple: all you need is the ability to love something without knowing what it is. However, the implications of this are immensely complex. All of a sudden there is context for relating to everything; the edge of the universe is simply gone. 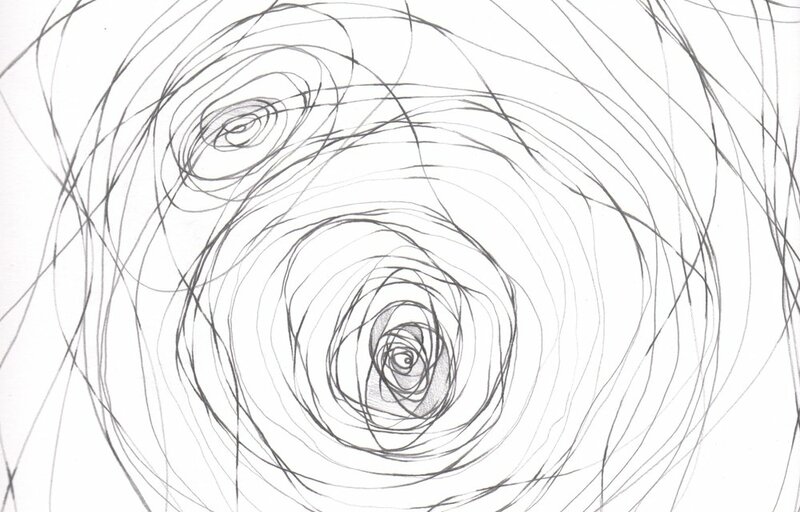 Attractor 4, 2014. Graphite on paper. The very first Pleiad I met died in 2013. Dr. Hudson was a professor who taught me to value what I found meaningful even when nobody else did. I had an artistic style that wasn't popular with my art teachers, and a writing style that the English department found "too weird". When I visited Dr. Hudson in his office, we talked about literature, travel, languages, philosophy, and science. While I didn't always feel understood, I learned that it didn't matter. All that mattered was that I loved my work. I’m not sure I agree that we should always believe in ourselves. After all, sometimes we really aren’t competent or trustworthy—nobody is. But I do believe, thanks to Dr. Hudson, that we should always, always believe in what we love. He gave me so much, but I'm not sure what I ever gave him; he just seemed to enjoy talking to me. Perhaps being a father figure was simply a role he enjoyed—I know that he kept in touch with other students long after they graduated. He was never too busy to listen to me, never laughed at my problems, and was always fearlessly open, sharing his stories, his interests, and his vast knowledge and experience, whenever I asked. I know I probably needed him much more than he needed anything from me, but that is, after all, the nature of parenthood. And I suppose I can make a return on his kindness to me is by doing the same for my future daughter. As I wrote in my last post, this year I participated in San Francisco Open Studios for the first time, at the beginning of the month. This was my first time doing any kind of formal exhibition (aside from participating in group shows), and so I wisely dialed down my expectations. If it was only my friends who came, that would be ok. If I didn't make many (or any) sales on the weekend itself, that would be ok. Even if nobody showed up at all, it would still be ok.
As long as I got a chance to practice talking about my art, or at least displaying my work, that would be enough. And, while I was waiting for 11AM on Saturday November 3rd (the official opening time), I looked around at all the art I've made this past year, and it felt really good. I had already pre-sold about a third of the original artwork, so I knew that this was my last chance to be near some of my paintings. Every painting carries a lot of meaning for me. Each is filled with memories of what I was doing and thinking and feeling at the time of its creation. It's a trite sentiment, but it's true: every painting carries a piece of me, and there is one kind of bereavement when it is finished, and another kind altogether when it is sold. 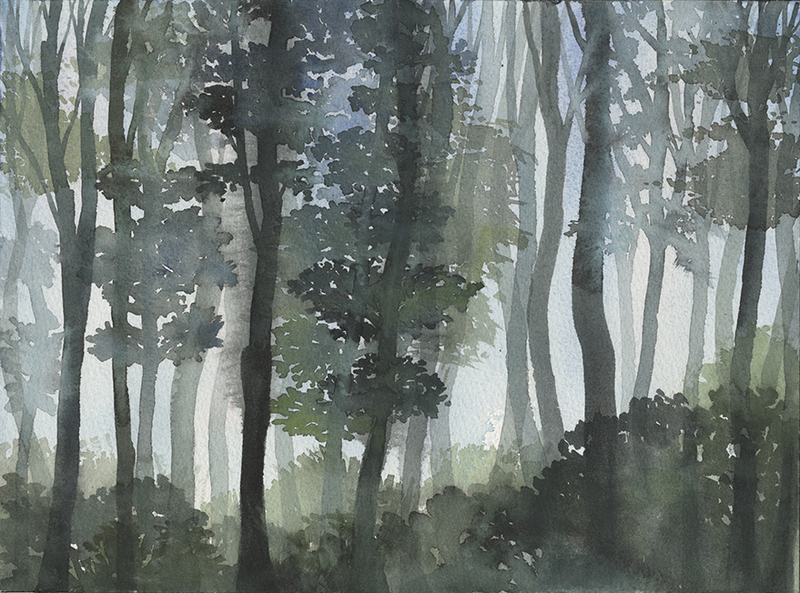 Composite Landscape IV (2018); 9” x 12”, watercolor on paper (Sold: Somerville, MA). References: Ithaca, NY; Shenandoah National Park, VA; Mount Davidson, CA. As it turned out, that weekend comprehensively exceeded the expectations of my most optimistic friends. Every secret hope I cherished, when I wasn't busy wisely lowering my expectations, was left in the dust. Friends (including friends and acquaintances I hadn't seen in over a decade), strangers, curators, and neighbors filled my studio for the greater part of the weekend. Orders from social media flooded in. One woman, who had done her research on my portfolio and who I had never met before, bought a piece of art that wasn't even up for sale: I had to dig it out of my closet and come up with a price on the spot. They came in waves. I was often so busy answering questions and making sales that my wife had to help. Altogether, about a hundred and fifty people stopped by. Given how far into the San Francisco residential boonies I am located, and how far away from any other artist's studio, I was amazed. I'm still amazed. This wasn’t my first venture into selling my artwork. 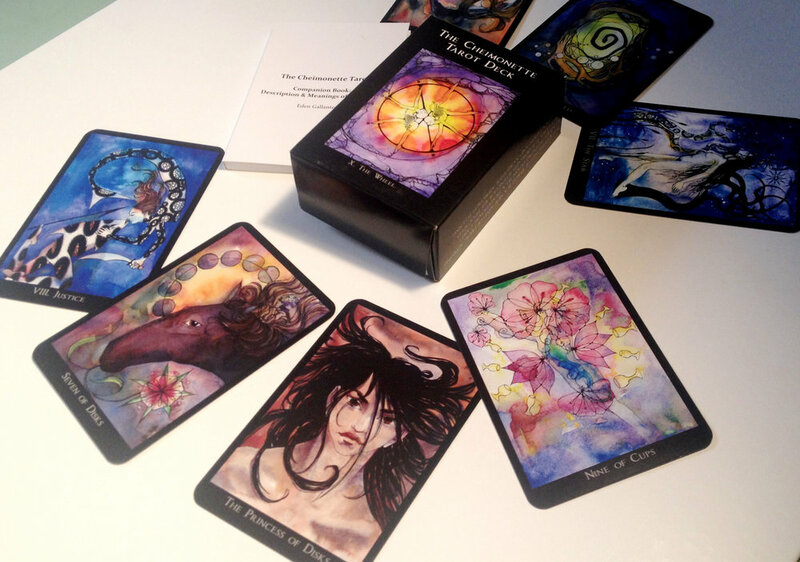 The tarot deck I created, and which was published via a Kickstarter in 2013, has continued to sell, reaching more than 36 different countries across all seven continents. I write each one of my customers personally, and they often respond, explaining why they felt drawn to my artwork, telling me about their home town or home country, and describing the creative ways they use the deck—in their psychotherapy practice, improv groups, performance art, theater troupes, retreats, workshops, meditative and creative practices, and the classes they teach. I've never managed to habituate myself to how touching and wonderful this experience is, no matter how often it’s happened. Every time a customer writes me back, even if it's just to say a quick thank you, I think about how they are using something I made, making it their own, and interpreting it and using it in ways I could not have imagined. I am humbled, I am grateful, I am honored, every single time. Now the same things are happening with my paintings. Original paintings and limited edition prints are now hanging on the walls of friends, strangers, neighbors; they are now part of their home, their daily life. Frequently, I have gotten to meet these customers in person. As they integrate these pieces into their daily consciousness, discuss them with their family and friends, and share them with their children, my artwork will come to belong to them as much as to me. To me, this is the best thing about being an artist. To use a somewhat crackpot metaphor, seeing a piece of art that I really love is like finding a poem I wrote when I was nine (my first really good piece of writing, which I have never posted or published and probably never will), inscribed on a tablet in a ruined temple on the steppes of Mongolia. It has always felt like a miracle that someone I have never met and with whom I have little in common can reach right into my secret soul, through the exquisite meaning and beauty of a single piece of art. I always try to learn about the artist, if possible, after I have seen their work. Sometimes I find an unrelatable personality, an ugly story, or an individual I wouldn't even like to meet. Maybe this sounds strange, but I am always pleased when this happens. It is rare, but I find a terrible person behind the art I love in maybe one case out of forty. It is painful to find so much evil in the world. It is discouraging to be around people who do not share my values, and to read true stories in the news that are full of violence, hatred, and selfishness. Finding that a person who is otherwise hateful (say, Richard Wagner) has nevertheless produced a work of sublime beauty that has moved and inspired me is, well, comforting to me. I believe it is a very human temptation to slide towards the annihilation of everything we find morally repugnant: ignoring the homeless, neglecting the ill, smugly denigrating the ignorant, or disowning killers, rapists, and abusers as human beings. Like many human temptations, this one runs contrary to the work I want to do in the world. Every wonderful work of art, music, or writing, every groundbreaking scientific discovery, every advancement we as a whole make towards truth and kindness and courage gives me hope. A person's works do not redeem their moral transgressions—the exquisite music Wagner wrote does not excuse him from mistreating the women in his life, nor from his contributions to Nazi ideology. However, it does remind us that we share a common human nature, which is, was, and always will be capable of the most hideous evil, world-changing accomplishments, abject cowardice, astounding strength, and profound love. This is my monthly art-related newsletter/blog. It's generally about the new art I've made, news about exhibitions, and other art-related ideas I've been thinking about. 1. This year, I am participating in San Francisco Open Studios! This means that my studio will be open to the public for a whole weekend. My neighborhood's weekend will be on November 3rd and 4th, from 11AM - 6PM both Saturday and Sunday. My best artwork from the last year will be up for view (most of it will also be for sale), and I'll have a limited number of signed and numbered pigment prints for sale as well. If you live in or near the San Francisco Bay Area, please come!! I would love to answer your questions about my art, say hello (even if I haven't met you yet), and/or graciously leave you alone if you want to look at my art in peace. There will be snacks and nice places to sit, and a weird-looking white kitty to pet. The address is 110 Santa Clara Avenue, San Francisco. This is one of those unusual neighborhoods that has plenty of parking, AND is an easy walk from public transit (the West Portal MUNI station). 2. Fifteen of my original tarot paintings will be on exhibition through the end of the year at Azari Vineyards in Petaluma, starting in mid-October. The estate is an incredibly lovely place to visit—they even have a guest house!—and their wine is really and truly superb. You could take advantage of this beautiful autumn weather to plan a day trip to taste some wine, look at my paintings, admire the beautiful views of Petaluma Gap, and take a stroll around the grounds. For those of you who don't know already, I published a tarot deck in 2014, and despite zero advertising on my part, sales continue to be pretty great (thanks to the photos, reviews, and videos posted by my amazing customers!). The only continent right now that doesn't contain any of my tarot decks is Antarctica—anybody know a tarot-lover in Antarctica? As for the art I've been working on recently, I seem to be on a little bit of a hiatus. I'm done with my insect/flower paintings, and I've got a really big, interesting idea for my next series, but the idea hasn't finished cooking yet, so to speak. I know from experience that I can't rush these things. I just have to keep scribbling notes and sketches in my sketchbook and thinking about what it is, exactly, that I want to make. When I'm developing an idea, I start chasing other people’s art. I spend hours in libraries, thumbing through picture books on history, urbanism, botany, ecology, neuroscience, marine science, or whatever. I spend hours in museums, sometimes spending all my time in one room, scribbling furiously in my sketchbook about a train of thought originating from a single sculpture and then racing home to look something else up. Sometimes nothing else will do except wandering around the city at some odd hour, listening to the strangest and least music-like recesses of my music collection. I don't yet have a good explanation for the new idea I'm working on, but I'm going to try anyway (after all, I suppose that's why you're here, reading this). I want to make art about impossible urban places: architectural interventions that make cities more accessible, more surprising, more imaginative. In particular, more human and less...institutional, I guess. Huge cave-dwellings, stretching out and interconnecting below the basements of skyscrapers. Treehouses installed in the recesses of highway overpasses. An entire apartment block gutted of its rooms and floor subdivisions, a shell for an empty, quiet, cathedral-like space, cut through by shafts of light from the vast wall of windows, with ladders and hammocks and bunks and bookcases covering the walls. None of these ideas are in any way feasible, or even desirable, in real life, but that's exactly what I like about them. I think there is something in me, as an artist, that has a great antipathy to anything practical. Perhaps this secret dislike extends farther than myself: maybe it’s shared by general scientists, or people who work in pure mathematics, or unpopular philosophers, or kids and teens who want nothing to do with the grownup world of trading 40+ hours a week of the only life they'll ever have just for the privilege of continuing to survive. Anyone else? The rococo aristocracy, hobos riding trains, island-owning billionaires, anarchists foraging for meals in restaurant dumpsters and squatting in condemned buildings: people who try to place themselves far above or far below the mundane concerns of modern mainstream survival? I certainly don't mean to propose generalizations. It remains difficult for me to imagine the variety of different reasons a person might have to long for the freedom of a permanently unrealistic world. I know that most seek to contribute in material ways to the world around them. An architect feels pride when she sets foot in a building she designed, and observes how the occupants use it. The world is full of research scientists who long to find a cure for cancer, a way to reverse global warming, a new innovation that will end world hunger. I am no exception. I would not be able to live with myself if I didn't keep trying to find ways to positively impact the people and places around me. But I do think there are those of us who, while we know there must be practical innovations to change the world for the better, yearn for a world of pure ideas, where everything is possible. To be honest, that kind of world really doesn't sound important, even to me. It sounds like the insipid fairyland of a very spoiled child who never managed to grow up (welcome, by the way, to the deepest of all my fears about what I really am). Nevertheless, brain scientists and psychologists tend to believe that it is important. They describe us as existing within a "layer of thought", which acts a neurological buffer between our own impulses and the sensory information we receive. Our ideas, our beliefs, our worldview, and our moment-by-moment experiences are often largely intellectual in nature. The social sciences are full of studies illustrating that people get by on dreams even more than they do on realities. Viktor Frankl, who survived Auschwitz, knew this. “Ever more people have the means to live,” he wrote, “but no meaning to live for.” Not only does this world of impossible ideas help us survive, it does so by being the most desirable part of human experience—by imbuing it with interest, joy, meaning. I always end up believing that this impossible world is important, and not because of all the scientific, political, and moral arguments backing it up, either. I just believe in it because I can't help loving it, even if I and everyone else turns out to be wrong, and it really is just a waste of time. It is my own core belief. If this isn't true, then nothing is true. This is my monthly art-related newsletter/blog. Usually, its contents include new art I've made, news about exhibitions, and other art-related ideas I've been thinking about. However, August has been pretty rough, and so I wrote about pet death, family, and life history. If you'd rather look at the art I've been working on, please check out my new art-only instagram account, @edengallanter. This month my sweet, two-year-old cat died of cancer. One day she was running and playing, and jumping into my lap every time I sat down. The next day she started acting sick, and after two subsequent visits to the hospital, the doctors told me that she had cancer—lymphoma. It was incurable, and she was only going to get worse. We arranged immediately for a vet to come to our home to euthanize her, and she died in my arms. It was so shockingly fast. If you've ever had a pet to whom you have a special connection, who follows you around the house, who trusts you, and just wants to be near you all the time, you already know that this pet feels like family. Whatever the world family has come to mean to you, it acts as a soft, warm cocoon around your heart. Family, whether made up of biological relatives, caretakers, close friends, partners, or pets, is one of those parts of life that appears to me to be fundamental, and vitally important for survival. I am very close to my parents, and I know how lucky I am that this is so. Many people I know have bad luck in this regard. They have parents they are unable to connect to, or unable to respect. Some have parents who were cruel, or violent, or neglectful, or who abandoned them. I am fortunate to have parents I can love and admire, and who have always, always strived to be loving, supportive and faithful to me. My Father. Charcoal on paper. My parents are also quite old—especially my father, who turned ninety this year. I am writing his biography. This is both intensely pleasurable for my father, and incredibly difficult. There are few happy memories of childhood and youth to detail; an overwhelming number of his recollections are marked by loneliness and tragedy. It is an incredibly intimate experience to do this with him. He has now told me stories he hasn't told anybody else. Sitting with him, holding his hand, sometimes crying with him, while listening to these memories that have been buried for so long, touches me deeply. In writing a story, we are always haunted by the story's end. Both my parental grandparents died suddenly of cardiovascular disease in their fifties, his elder brother in his forties, and my father himself survived a triple bypass when I was in the third grade. Nevertheless, he is ninety, and I couldn't help wondering what it would be like when my dad passed away, as I was spending my last remaining days with my sick cat. There is no real way to prepare for tragedy. I believe that the best we can all do is try to face the inevitable, and accept the fact that the world we live in gives us an illusion of control on a truly immense scale. There was no way for me to prepare myself for losing a very young and beloved pet to cancer. All I could do was focus on what mattered, when it happened. I wasn't ready to say goodbye, but I knew that the most important thing was my responsibility to take care of her. In this case, that meant protecting her from suffering any more pain. I stayed awake every night to sit with her. I could barely eat—food choked me. Grief can fill you up and bury you at the same time. The world around us faded. I couldn't even feel the chill of the house, sitting on the floor with her at 4:00 AM. I sat there, with my dying cat leaning against my leg, and I thought about what it would be like to lose my father. The culture I live in has shielded itself from death. Death happens in hospitals and dark alleyways. Open casket funerals are increasingly rare in this country. The processes of mortality are more secreted away from us that they used to be. But isn't death as natural as the ocean? Can't death be as gentle as the wilting of cut roses, which leave behind a subtle fragrance even after they have faded? It seems to me that life is very short. Living in perpetual fear of tragedy isn't realistic, but at the same time I believe I ought to make the most of whatever time I have with the people I love—my little family, my close friends, and the small number of people who have profoundly inspired and changed the course of my life. I don't have an answer for grief, or for the inevitability of future grief when you let yourself love someone. Grief is a living creature, with its own logic, its own desires, its own food. All we can do is care for it as tenderly as we would care for anything else we loved. Life is an old man carrying flowers on his head.